Platform and browser » Me, Myself, Why? I’ve just finished a project for the Psychology Department at Bangor University, which involved logging various pieces of data on participants as they used the web interface to the survey. One of the most interesting aspects from my point of view was the platform and browser of the participant. Out of the 834 participants in this sample, 770 (92%) were using Internet Explorer or Firefox, with a 71/29% split between these two. In the “other” category was Chrome (4%), Safari (2%), and Opera (less than 1%). Non-Microsoft platforms were noticeable by their paucity – 2% for the Mac, and 1% for Linux. 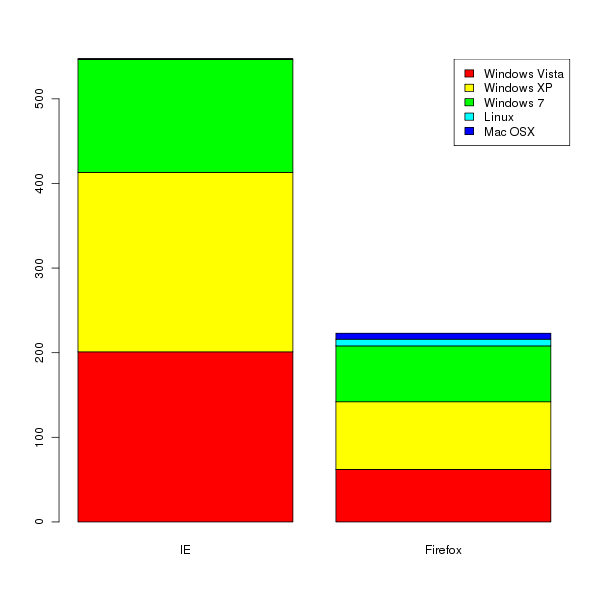 Of the Windows flavours, XP was the most numerous (37%), followed by Vista (33%), and then 7 (26%) – there were even a couple of instances of 2000! It could be argued that the sample of participants in a consumer survey may be slightly skewed, and not totally random, but these figures are a useful corrective to the figures for “power users” (itself a skewed sample) which we may be more used to seeing reported on IT-oriented sites.